All the Fun and Fantastic Nursery Room Decor and Ideas You Need to Bring the Wonderful World of Disney to Your Little One's Nursery Room! Bring the wonderful world of Disney and its adorable, timeless characters into your baby nursery with the nursery decorating ideas you'll find on this page. A baby Disney nursery theme makes the perfect foundation for any nursery for a baby girl or boy, and if you choose your nursery room decor wisely this is a nursery theme that can last through toddlerhood and beyond! A Disney nursery is easy to create - just choose your favorite characters and let your imagination run wild. From Cars for boys to princesses for girls the wonderful world of Disney has something for everyone. You'll also find inspiration for your imagination in the gorgeous Disney nursery room decor available on the market. From Disney's fairies floating across the nursery wall to Disney's Woody riding to the rescue, you'll find everything you need to decorate your little one's wonderland at our Baby Disney Nursery Room Decor Store. 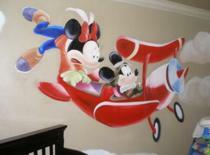 If you are decorating a Disney theme baby nursery enter it in our baby nursery photos contest here. You could win a great prize and we will add your nursery to this page to inspire other moms! The colors you use to decorate your Disney theme nursery will vary widely depending on the characters you choose. Too much bold color will make the room feel small and cluttered so choose your color focal points carefully. Keep your background color fairly light so that you can add bright and interesting color through the addition of your Disney characters. Here are a few Disney options that you can consider. Just bear in mind that certain Disney lines have more baby nursery merchandise available than others. 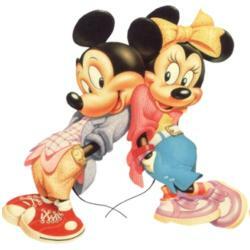 If you are planning to use readymade crib bedding and nursery room decor you should visit our Disney crib bedding store and our Baby Disney nursery decor store first to see what is available and make your choice from there. I'm sure there are many more that I haven't mentioned - watch some of the Disney DVD's available for inspiration. If you decide on a vintage Disney theme, there are plenty of posters and knick knacks available from the era of Donald, Mickey and Goofy. See our vintage nursery decor page for ideas on where to get them and how to use them in your nursery design. If you want to go for a cartoon type theme, you'll need to include lots of bright and colorful characters on your nursery walls. 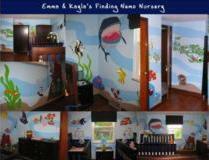 You can use nursery wall stickers or paint them yourself. Cars: Paint your baby's name across the hood of one of the cars. Nemo: Have a fish blowing bubbles to the surface and include one letter of your baby's name in each bubble. Jungle Book: Paint a tree so that it looks like your baby's name has been scratched into the trunk. Toy Story: Create your baby's name on the nursery wall using rope from Woody's lasso. Princesses: Spread your baby's name above the sky using glittery paint. The Little Mermaid: Write your baby's name on one of Ariel's underwater treasures. The Lady and the Tramp: Use the classic spaghetti scene and write your baby's name using spaghetti letters. Add a bunch of Disney storybooks to your baby's bookshelf. Share the wonder of Disney with her at bedtime. Cozy it up with a few soft toys.